“We are very different from other software services providers”, he quips. This couldn’t be far from truth for his is one of the few companies who were successful in bringing technology focus on Indore. Foraying from software services to R&D to BPO Impetus Infotech (India) Pvt. 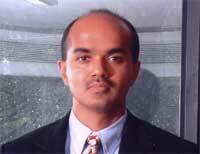 Limited was formed in 1991 by Praveen Kankariya, now its President & CEO. In 1996 he established Impetus Technologies Inc. in the U.S.A. He has also founded a service supply chain optimization software company- Servigistics, in Atlanta. Debashish Chakrabarty talked to Praveen about his company, his vision and his future plans. With over 15 years of experience in developing large distributed systems, Mr.Praveen was awarded a Masters degree in Computer Science from the Michigan State University and holds a Bachelors degree in Computer Engineering from S.G.S.I.T.S., Indore. Please tell us in brief about your company and its strengths. Impetus is an outsourced software R&D provider to leading software companies. We build cutting edge software products used in diverse environments employing emerging principles and methodologies like component based design and design patterns. Unlike other software services providers like Infosys and Wipro who derive bulk of their revenue from building custom software applications and implementing packaged applications for end-user organizations bulk of Impetus’ revenue comes from building software products for other software product companies. We have been working on software products for various domains, applying a variety of technologies, and addressing different techno-business requirements such as Supply Chain planning system developed for Dell and Toshiba. A variable annuity management and trading platform that we have developed is being used by some of the largest insurance companies of the US. We have also studied HIPAA (Health Insurance Portability and Accountability Act) and developed our own HIPAA Data Enabler, which is a XML based product facilitating generation of HIPAA compliant health care claims and enquiry formats. The solution is already in use in some of our clients’ applications. Impetus has evolved a Product Development Maturity Model (PDMM) on the line of Capability Maturity Model (CMM). Tell us about it. Impetus’ PDMM is not on the line of CMM. It’s not a quality assessment model, though its dimensions do affect the quality and performance of the software developed. The PDMM is basically a well-researched model of factors that are critical to the successful design and development of a software product. A good analogy is designing and building a house. A good architect will factor directions of sunlight, traffic flows in a household, ages of residents, climate, permanent wind directions and other such parameters in the design. Through the application of PDMM, we are better informed about all possible significant aspects that could affect a software products’ performance, applicability, usage, maintenance, etc. PDMM helps us address commonly found issues upfront rather than as an afterthought. Please tell us something about the research work done by Impetus and about the internally developed component suite. How has the partnership with companies like Sun helped Impetus? We have developed frameworks for the routinely needed components of web applications, internally called IBIZA. These components provide a head start in any new development activity, since we don’t need to start from scratch. This also leads to a shorter development time on any project, leading to cost savings for the client. Also, since these components are well researched and tested, the risk level reduces substantially. Also, such regular and continuous focus on research helps our engineers innovate and try new ideas, making way for a challenging and stimulating work environment. Another advantage is that like PDMM, these components (IBIZA) also ensure that we address every element of the software development upfront, which in turn makes the project planning, and management more smooth and predictable. Impetus is a technology partner of BEA, Sun and IBM. Partnerships with various technology leaders help us by providing access to new and upcoming technology options, which we can incorporate in our development work. Impetus University aims at the continuing training its employee. Tell us something about it. Do you think the emphasis of other companies in this regard is sufficient? Technology domain changes at a pace faster than a blink of the eye, and keeping pace with it becomes difficult. We set up the Impetus University to provide an internal medium for continuously updating the technology skills of our engineers, and helping them move up the learning curve much faster. Besides technical training, aspects such as soft skills and personal development are also looked at, enabling both professional and personal growth for the employees. A lot of companies claim to run internal training sessions, but it is the seriousness and regularity with which such programs are developed and run, that makes all the difference. We at Impetus regard our University with utmost respect and sanctity, and the management is committed to this forum. This is the reason why we have industry veterans, leading academicians and technology experts participating in the University programs. We have seen that the regions that have the intellectual capital, skills and pricing for offshore sourcing and application development such as India, China, Israel and the Philippines are also areas of high geopolitical tensions. How has the scenario after Indo-Pak tension of recent past and post 9/11 affected the offshore jobs for your company in particular and India in general? Yes, this does become a concern for our clients since they depend on us. I occasionally get calls when there is a flare-up on the Indo-Pak border. No company can deny that they have not been affected by 9/11. We depend on the US for most of our business. The ripple effect has touched us. We have responded by increasing the offshore component of every project. We have made substantial investments in our telecom and systems infrastructure during the downtrend. As a result, we are now seeing growth in the business due to a new trend of leveraging offshore development even further by US companies. What attribute of the Indian Software developing companies bring them offshore and other development jobs? Is it the quality or the price or something else? Well price is one of the important factors, but not the only one. With judicious use of the offshore process, a US based company can virtually see a 24-hour development cycle and see increased productivity and shorter time-to-market cycles. The Indian software advantage most definitely lies in the quality of work done by Indian software engineers and our long track record in managing globally distributed projects. MP has been trying to emerge as the next IT destination. The e-governance initiative in the state has also received acclaim in the past. How does Impetus view this and wish to participate in the process? What do you think should be the strategy of the MP government to attract other entrepreneurs and generate more employment for state’s unemployed people? The efforts of the government to usher in e-governance are commendable. Believe it or not, the digital medium will be seen as a poor man’s medium as the cost element is dropping by at least 40-50% per annum compared to other media like paper. The only hurdle is literacy. Our forte is technology and technology alone. We can definitely contribute by letting the government use our IBIZA components to create e-governance applications faster and cheaper. The government has definitely put significant efforts in promoting IT and IT-enabled businesses. But we still have a huge problem of a lacking positive momentum in any of our cities in the state compared to other cities like Pune and Bangalore. I worry that we might just miss the bus and not be able to develop a significant industry in Indore. Not a day goes by when we contemplate creating another development center in a metro so that we can scale our company without sacrificing our talent level. We have managed to create a great company using very bright talent that has largely come from the state. But we are concerned whether we will find enough talent of the same level to meet our growth objectives. Not many people, who do not have a connection with the state, are willing to move to the state from other regions of the country. This is largely because the state is still not visible on the IT map of the country. The state should focus on a very small but high impact steps to create a small groundswell in the local IT industry. This will require very focused efforts as well as leverage the great educational institutions in the state like the IIM. The BPO business sector has recently seen major upheavals; Spectramind sold to Wipro and CustomerAsset to ICICI; many other big and mid sized companies like Infosys, Cognizant and Polaris are in the foray too. Is Impetus in the fray too? Why has this suddenly become a big-boys game? BPO is an emerging field of business and has the potential to grow into a huge and long-term business option. The Indian IT enabled services market is projected as a Rs. 81,000 crore business opportunity providing employment to 1.1 million by the year 2008. Indian BPO service offerings are graduating from pure transaction-intensive services towards highly specialized services like R&D, customized offerings and domain expertise provisioning. The established IT companies in India already have some large clients. Getting into BPO for them is an extension of the services spectrum. Also, since Indian IT has already proved its mettle, it is that much easier for Indian firms to convince potential prospects about India’s ability to handle other process and operations outsourcing assignments. Add to that the fact that Indian BPO can improve the value of outsourcing relationships by way of enhanced productivity, reduced cycle time, decreased transaction cost, and improved time to market – and this becomes a win-win situation for all involved. As regards Impetus, we are looking at it from serving our existing base of clients who are predominantly software companies in many more ways. For instance, we are providing worldwide phone-based customer support on behalf of one such software company. We are trying to leverage the knowledge of a client’s software product and our relationship in ways other than software design and development. This includes customer support, professional services, application monitoring, data analysis etc. In short, we can be said to be providing BPO services, but in niche areas.